BMW’s M Division has officially unveiled the new BMW X5 M Sports Activity Vehicle (SAV) and BMW X6 M Sports Activity Coupe (SAC). Both variants come with a similar powertrain setup, a new M TwinPower Turbo V8, which is said to be the most powerful engine developed for the firm’s all-wheel drive models. The mill is equipped with a pair of twin-scroll turbochargers, cross-bank exhaust manifolds, VALVETRONIC and direct injection which help the 4.4 litre V8 produce 567 hp from 6,000 rpm to 6,500 rpm and 750 Nm of torque between 2,200 rpm to 5,000 rpm. Both models send their power to all four wheels via the xDrive intelligent AWD system with Dynamic Performance Control, which is coupled to an eight-speed M Steptronic automatic transmission with Drivelogic. The 0-100 km/h sprint in the BMW X5 M and X6 M is completed in exactly 4.0 seconds. Top speed for both models are electronically limited to 250 km/h. BMW quotes a 20% drop in fuel consumption pending official EPA figures, with C02 emissions down to 258 g/km. A myriad of electronic features are present in the new models, most of which lean towards the performance spectrum rather than the economy side. Launch Control, for instance, helps the driver achieve an optimum getaway from standstill and the Dynamic Stability Control (DSC) allows for different parameters. Three modes are available under DSC – DSC on, MDM (M Dynamic Mode) and DSC off – with the levels of electronic assistance decreasing respectively. New on both models, various safety and comfort features have been programmed under the DSC umbrella, such as Brake Drying, Brake Standby and Start-Off Assistant. The BMW X5 M and BMW X6 M both come as standard with non-runflat Michelin Pilot Super Sport UHP tyres, measuring in at 285/35 for the front and 325/30 for the rear. They wrap 21-inch forged wheels. Stopping power comes courtesy of six-piston fixed calipers at the front and single-piston calipers at the rear. Compared to its predecessors, the brake pads are now 50% larger and weigh 1.6 kg less. All four discs on both models are perforated and inner-vented with the calipers painted in blue. Looks wise, the front of both cars are not exactly what one would describe as subtle with large air intakes being required to aid cooling for the transmission, engine and front brakes. The flaps located down under help to reduce lift and improve aerodynamics, another cue taken from the track. The Air Breathers, located behind the front wheels, help to reduce turbulence generated in the front wheel arches when the vehicle hits a certain speed. 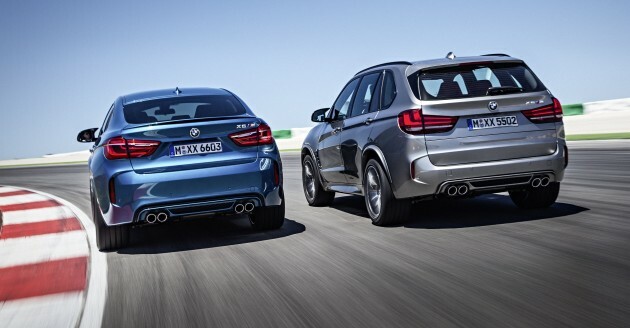 At the rear, a distinctive quad-exhaust setup integrated into the diffuser help distinguish it from lesser models, with the X6 M getting a rear spoiler. Step inside either model and a M-specific leather steering wheel with paddle shifters are present along with electrically operated M Multifunction seats, trimmed in Merino leather and embossed with M logos. Added features include a power tailgate, four-zone auto climate control and Harman Kardon surround sound system. Two new exclusive paint options are available, Long Beach Blue Metallic and Donington Grey Metallic. 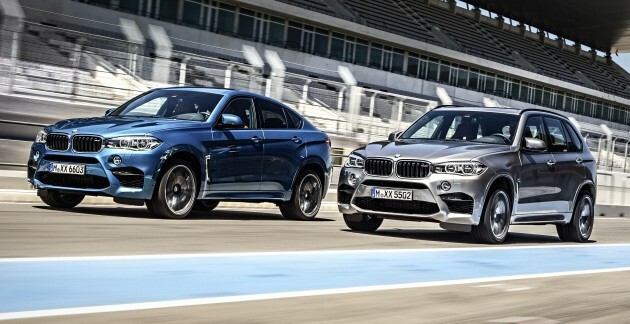 The BMW X5 M and X6 M are expected to make their debut at the upcoming 2014 Los Angeles motor show. I regret getting an Audi, Audi transmission is problematic like hell, ride is hard and harsh, and the bloody engine consumes engine oil ! Those wanting to buy this car, just wait 1 year after it has been launched. You can buy the car for half the price. This what happens to BMW cars especially the high end ones. Like even now, you can buy a 2013 BMW M5 for RM500,000. A brand new unit cost over a million. Be a wise consumer. Let the first owner bear the bulk of depreciation. Let the first owner lose at least half a million in cash. You are after all buying a 1 year old car. Still got warranty. Nothing to fear. But you will be getting the car for half the price. That is BMW in Malaysia. Within 10 to 11 months, the car loses so much in depreciation. But 2nd year onwards, it stabilises. Maybe RM30k to 40k a year from the 2nd year onwards. I might add, if you are losing sleep over depreciation, you’re DEFINITELY living beyond your means. The Ultimate Bullying Machine !!! im sure it will beat hell out of it. When will Malaysia launch this? But I am sure it will be sky high pricing. Only those kerabat diraja can buy, not because they are rich. Its because they are corrupted and tax-free for imported Conti cars. TMJ is goina get one. wait and see. And those filthy cronies. what is the kerb weight for both car? Ganas looking…that’s what the designs of those two M models give me the impression of and rightly so for the kind of monsters they are on the road. 4 sec century sprint is insane for this 2.5 ton monster! I still think the SUV-crossover-coupe X6 (and X4) looks like a giant sedan from the rear. A really nice giant sedan, but a giant sedan lookalike nonetheless.